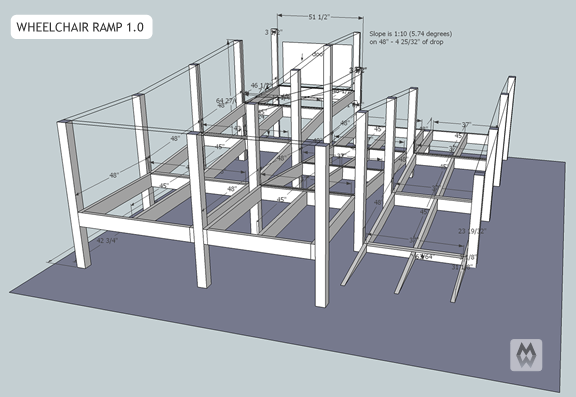 I’ve been tinkering with Google SketchUp and have been really impressed with how easy it is to pick up and create some very cool and quite accurate drawings. So, I’m officially adding Google SketchUp design services as a marketable skill to be included in the Manatt Web suite of offerings. Before you bombard me with requests and lots of money, I should warn you that it takes me an inordinate amount of time to do these things and I charge by the hour. So, if you’re OK with that, I’m too. Just head on over to www.manattweb.com and click the big GET STARTED button and we’ll be in business. 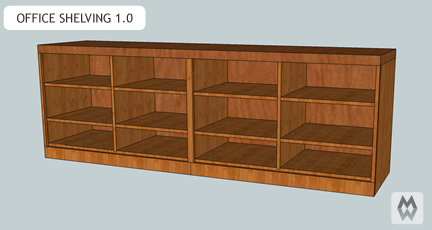 This will be some cabinets I build in our office. The top will eventually extend and become a desk and the entire unit will fill one of the walls. It is deep enough to add bookcases above and will also have doors added to the front to conceal the junk…I mean, valuable treasures we need to keep there. This monster is a wheelchair ramp that we’ll be building in a house for CityFest. I will feature a gate and steps at the end of the first leg of the ramp (v. 2.0) to accommodate able-bodied people. The construction material will be pressure treated dimensional lumber. This project will also feature replacing the front steps and a wheelchair “boardwalk” from the carport to the mailbox as well as some basic landscaping and all around care. If you’re in Central Arkansas on or after Oct. 2nd, come on by at the corner of Hwy 10 and Russ St. and be sure to bring your gloves and a hammer or two. You won’t be alone as literally thousands of people from the area churches will be out in force that day loving on our cities with the sweat of their brow and the work of their hands.